Revenue in the Eyewear market amounts to US$41,278m in 2019. The market is expected to grow annually by 1.4% (CAGR 2019-2023). In global comparison, most revenue is generated in United States (US$32,288m in 2019). In relation to total population figures, per person revenues of US$54.57 are generated in 2019. The Eyewear market covers unmounted Spectacle Lenses, Sunglasses, frames for spectacles, and Contact Lenses for private end consumers, excluding protective eyewear and safety glasses. The most important brands, especially when it comes to sunglasses, are Ray-Ban, Dior, Gucci, Boss, and Prada. The Eyewear market relies heavily on imports from Asia (China, Thailand), while a significant production exists in only a few European countries (Italy, France, and Great Britian). With regard to distribution, there are two major types of brick-and-mortar retail businesses: specialist opticians (Fielmann, Apollo) and stores that are not specialized in selling eyewear (drugstores, supermarkets, fashion stores). This especially applies to the Sunglasses segment. In addition to brick-and-mortar retail stores, online stores for optical goods (Mister Spex, Brille 24) have secured a firm foothold in the market, too, although half of their revenue is generated from the sale of contact lenses and care products. Reading Support Revenue in the Eyewear market amounts to US$41,278m in 2019. Reading Support The Eyewear market is expected to show a revenue growth of 1.5% in 2020. Reading Support The average revenue per person in the market for Eyewear amounts to US$54.57 in 2019. Reading Support In the market for Eyewear, volume is expected to amount to 2,735.5 m pcs. by 2023. Reading Support The market for Eyewear is expected to show a volume growth of 0.5% in 2020. 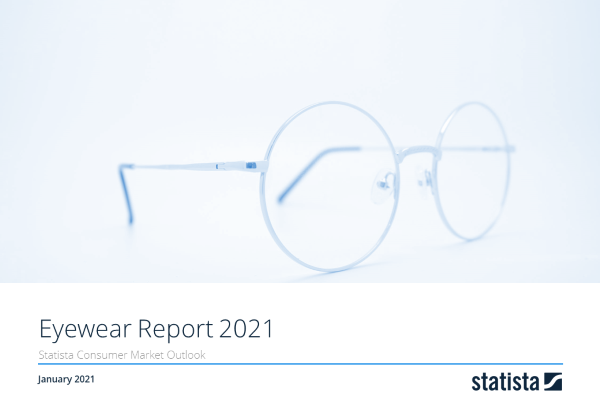 Reading Support The average volume per person in the market for Eyewear amounts to 3.56 pieces in 2019. Reading Support The average price per unit in the market for Eyewear amounts to US$15.34 in 2019. Reading Support With a market volume of US$32,288m in 2019, most revenue is generated in United States. Here you can find more studies and statistics about "Eyewear".